As I travel for client and industry events, one thing stands out in this post-business-casual world—the blue blazer. This longstanding staple of a professional’s business wardrobe has in many ways come to represent the stodgy, archaic ‘good ole boy’ conventions of years gone by—and is today often associated with outdated ideas, technologies and models of learning. The blue blazer is safe. It can be worn with everything from a button-down oxford to a polo, to a t-shirt. It can be worn with jeans or khakis—and with—or without a tie. 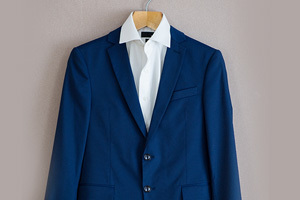 However, there is nothing unique or inventive about a blue blazer. Today’s trailblazers are increasingly shedding the blue blazer and the blue blazer mindset. Innovators across industries are not only making radically different fashion statements, but equally drastic changes to the way knowledge is transferred at live and virtual events. In this age of rapid change and disruption, the last thing people seem to want to epitomize is adequate and ubiquitous. Today’s business gurus and TED Talk pioneers all preach the message to push revolution in thinking, embrace change and face fear for the purpose of disruption and innovation. If organizations and individuals don’t take risks to evolve and differentiate to meet modern needs, they will slowly dissolve and disappear. To be clear, I am not advocating judging one’s ability to innovate by his/her choice of attire. After all Steve Jobs was pretty creative and he wore the same outfit almost every day (though, it should be noted that he did not wear blue blazers). I am merely suggesting that the blue blazer symbolizes complacency and paradigms that are no longer relevant in today’s society. I am excited about the opportunities for future meetings and events, which are built on new platforms and engagement channels. I hope that all meeting professionals will relegate blue blazer thinking to the back of the closet, in favor of more modern ideas. Let’s make every convention unconventional and create opportunities for learning and networking that are truly meaningful for the professions and industries we serve.